The Northfield Garden Tour of 2015 is finished, and I really enjoyed having so many visitors to my yard. It’s interesting to see what people ask about when they are on a tour–and I had three items that lots of folks were especially interested in. What’s this pretty orange annual? 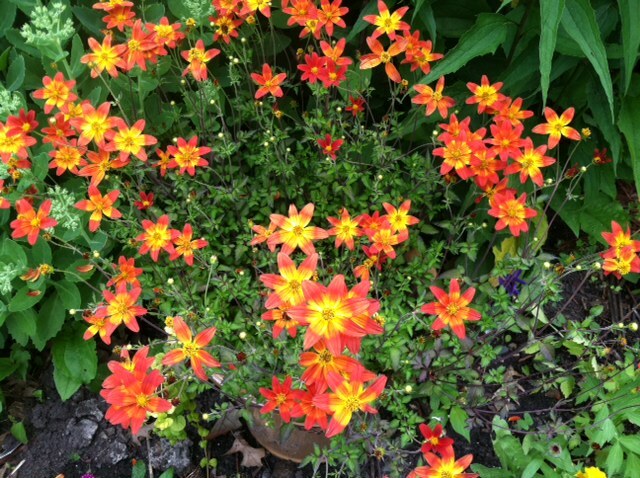 Probably the most asked about bloom in the garden were these Campfire™ Fireburst bidens, which are an annual that I am testing for plant wholesaler Proven Winners as part of its garden writers trial plant program. Campfire is one of the most productive, bright annuals that I’ve ever tried and I think it is indeed a winner. The shades of yellow and orange brightened up the small herb bed that I have at the front of my house. I’m growing them in pots, but you could certainly grow them in the front of a bed as well. These are not on the market yet, but will be in nurseries and garden centers in 2016. Not really. 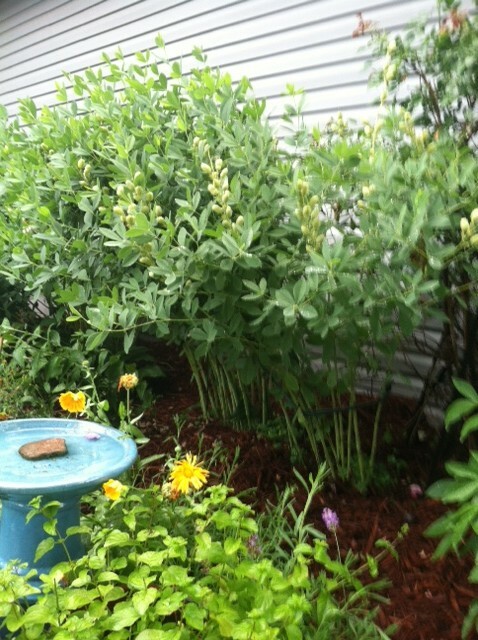 I have several Twilite Prairieblues baptisia around my front yard, which are perennials that act like shrubs. 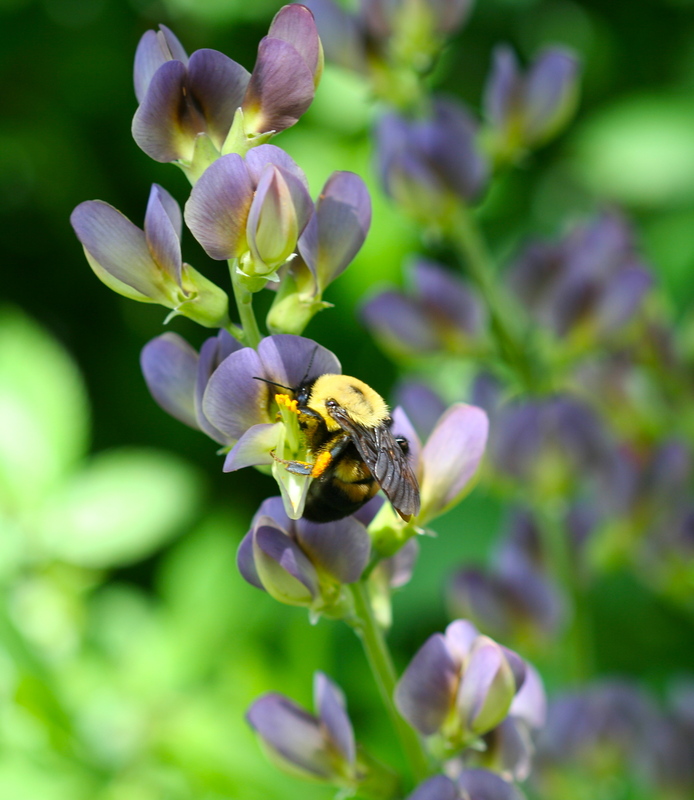 I love baptisia (also called false indigo) because it is a prairie plant that the bees love. It blooms in June with purple flowers on spikes. There are white and even yellow baptisias, but I like the purple/blue ones. After blooming, the plant forms seed pods, which eventually turn black. I leave mine standing all winter, and sometimes shake the seedpods, which make a rattling noise. In spring, I cut the plants back. This can get to be a big plant (more than 4 feet high and almost that wide), so they may require some tying up or pruning back. I use half-hoops and bungee cords (one of the most under-rated garden tools around) to keep mine upright and looking pretty. Yes, you can! They are sour cherries. My cherry tree was full of ripe berries and quite a few garden visitors sampled the fruit. I really like my little Bali cherry tree, which is a handsome, short tree in the front yard. 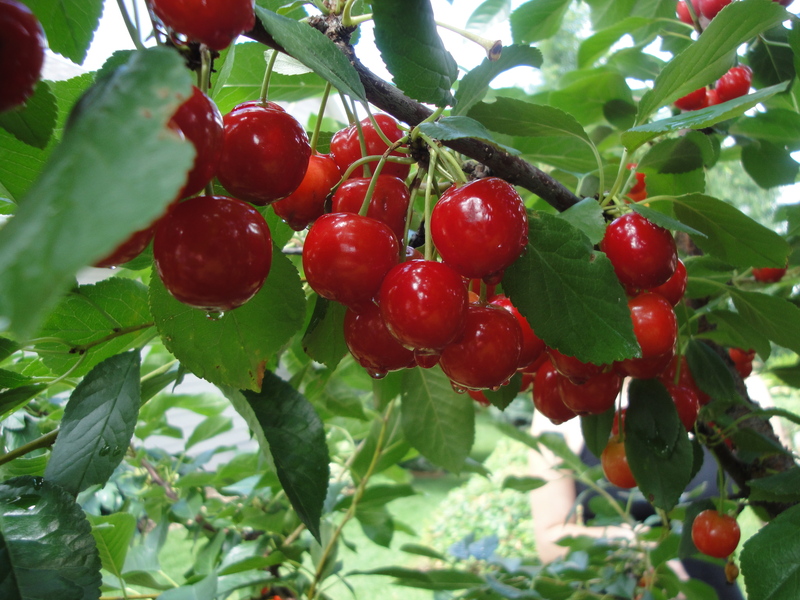 After the tour, I went out and picked a couple of gallons of additional cherries. The rest are pretty ripe or hard to reach, so I left them for the birds to enjoy. Now that the tour is over, it’s time to relax and enjoy the garden. Bugee cords – that’s brilliant! Relaxing after the tour ends is the best part of having one! I had about 250 people in the garden this week, on two different days. It was exhausting getting ready for the groups but such a pleasure to answer questions and explain the stories that my garden tells. Definitely worth the effort.